Why do we catch colds? What causes seasons to change? And if you fire a bullet from a gun and drop one from your hand, which bullet hits the ground first? In a pinch we almost always get these questions wrong. Worse, we regularly misconstrue fundamental qualities of the world around us. 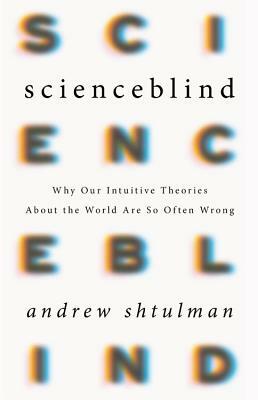 In Scienceblind, cognitive and developmental psychologist Andrew Shtulman shows that the root of our misconceptions lies in the theories about the world we develop as children. They're not only wrong, they close our minds to ideas inconsistent with them, making us unable to learn science later in life. So how do we get the world right? We must dismantle our intuitive theories and rebuild our knowledge from its foundations. The reward won't just be a truer picture of the world, but clearer solutions to many controversies--around vaccines, climate change, or evolution--that plague our politics today. Andrew Shtulman is an associate professor of psychology and cognitive science at Occidental, where he directs the Thinking Lab. His work has been featured in Scientific American, CBS News, and the New Yorker. He lives in Pasadena, California. "[A] fascinating, empathetic book....Mr. Shtulman distills some useful ways to improve science education in the classroom and for the adult public." "Anti-vaxxers, creationists, global warming skeptics... I have devoted my career to understanding why people deny science in the teeth of overwhelming evidence. As the cognitive psychologist Andrew Shtulman shows in one of the most important books ever written on this most important subject, it turns out that it isn't the facts in dispute, but incorrect intuitive theories people hold about the world underlying the facts that is the problem. In this new age of fake news and pseudo facts, Scienceblind is a candle in the dark."